Gathering data for the Western Section of the next forecast which is scheduled to be released Friday, August 26th and thought I should share some of the facts and figures of recent economic performance among our neighboring states. 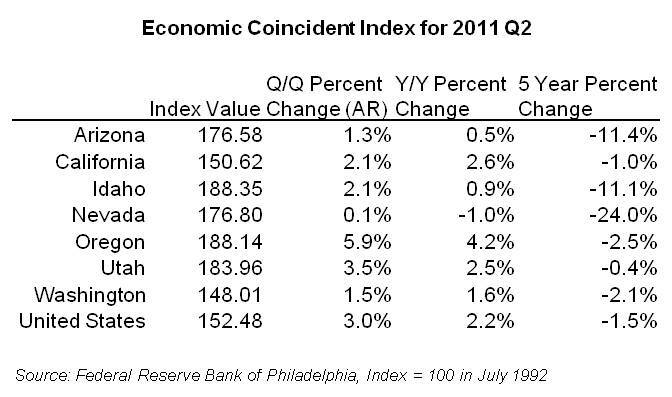 First up, the the Philadelphia Fed’s coincident index for the second quarter. Oregon’s quarter-over-quarter gain is the 5th fastest among all states, while Oregon’s year-over-year gain is the 4th fastest. These figures are nearly identical to the first quarter growth rankings when Oregon’s q/q ranked 5th best and y/y ranked 4th best. 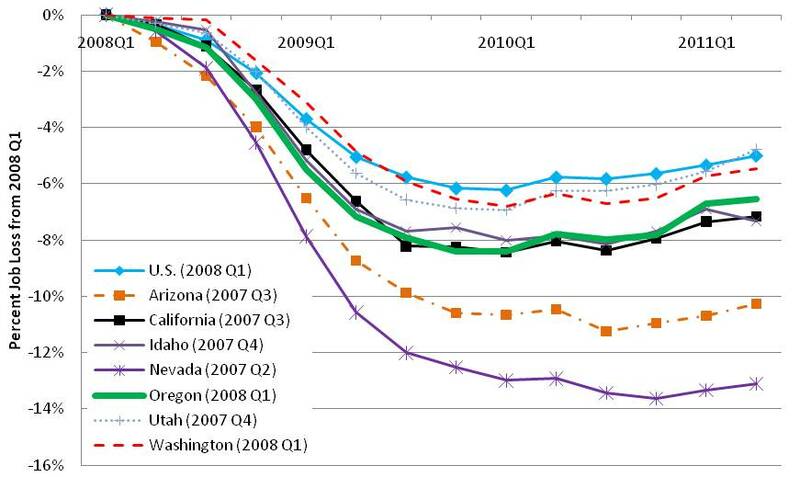 Oregon’s 5 year growth is 26th best, while the state’s first quarter ranking in this measurement was 30th best. 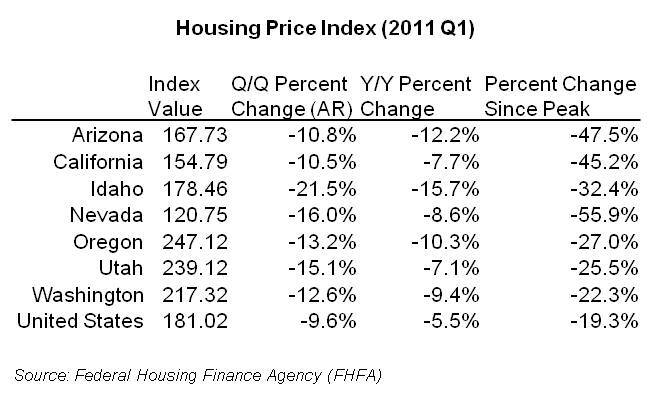 Next is the purchase only home price index released by the Federal Housing Finance Agency (FHFA). Data through 2011 Q1. Note that the published data is indexed to 1991 Q1 = 100, however for the purposes of the graph below, it has been indexed to 2000 average = 100. 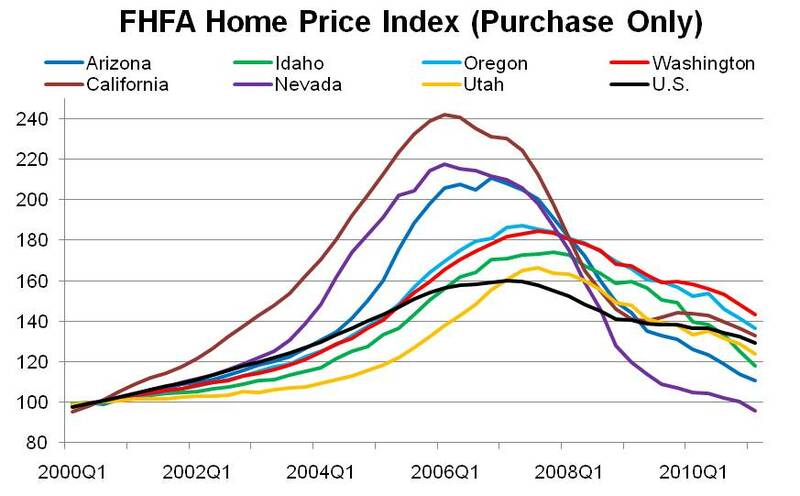 This is to illustrate the home price changes across Western states over the past 10 years. 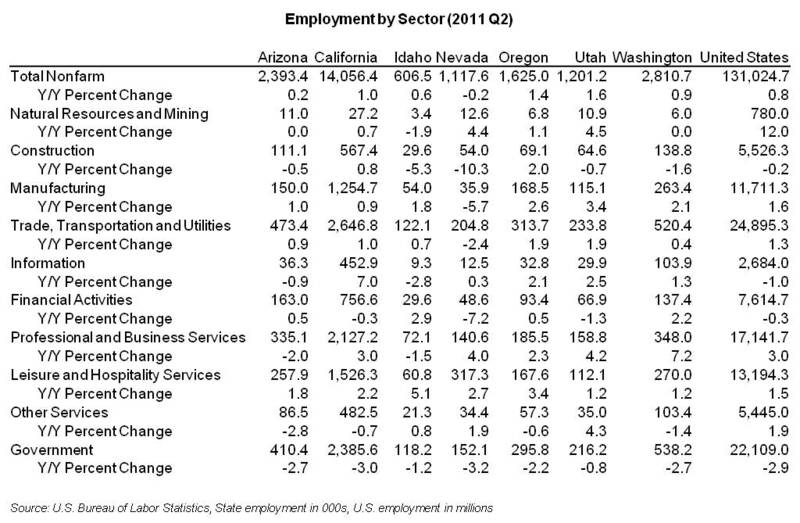 Lastly, the table below shows employment growth by industry for each of the Western states, followed by a graph showing total employment changes in each state since 2008 Q1. More information, including data regarding housing permits, exports and tax receipts for the Western states will be available in our quarterly forecast.